Ever since Cinecultist saw toked up Dave Chappelle inside the craziest taxi cab ever in 200 Cigarettes, we've been a fan. But our bemusement has turned into full on crush with the release of his concert documentary, Dave Chappelle's Block Party directed by the brilliant Michel Gondry (Eternal Sunshine of the Spotless Mind). 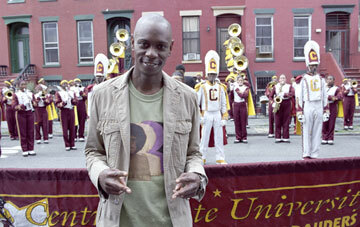 Filmed in 2004 at an outdoor concert Chappelle planned in Bed-Stuy part of Brooklyn, the film intercuts between the show which featured the reunited Fugees, Erykah Badu, Jill Scott, Mos Def, Common and others with shtick of Chappelle prepping and inviting folks to the secret show. Cinecultist actually heard about the concert before it happened and tried to get tickets but with no luck. We had to sign up on a website and sorta hoped that our last name which doesn't automatically indicate that we're a square Jewish white girl from the Eee Vee would help our chances. It didn't. However, what Gondry's captured here is more than just the show itself. It's Chappelle's asides, how he interacts with his fans and the amazing characters he invites along for the ride that make this an utterly charming movie. Some stand out bits: Chappelle and Mos Def's straight man/funny man Vegas lounge act banter complete with Mos on the high hat and snare. Erykah Badu pulling off her Afro wig mid-set and then crowd surfing her way off stage. The crazy hippie couple who live in the Brooklyn Angel building that becomes the backdrop for Chappelle's stage who invited Dave to come up and "rest his loins." The uber fussy band director from Ohio whose band travels all the way from the heartland to play Kanye West's hit "Jesus Walks" at the start of the concert. Cody ChesnuTT acoustic send out at the end of the film -- that guy really knows how to rock.